Edit: The Survey is now closed! Thanks to all of you who responded. We're cross-tabulating the results now; expect an announcement in mid-March. In the past, we asked respondents to choose one “label” that fits them the best, such as “data scientist” or “front-end Web developer.” One thing we discovered was that only about 7% of respondents were self-describing as “mobile developers.” By contrast, survey research conducted by other organizations has found that about half of developers are involved in developing for mobile in some way. This year, we’re asking respondents to check all labels that apply, so (for example) someone who primarily works as a full-stack web developer but also spends a significant amount of time on mobile development can choose both. In past years, we asked respondents to choose which technologies they had used in the past year, and which they want to use in the coming year, presenting one long list of technologies. In order to accommodate additional technologies, we’ve broken this up into a series of four questions — one about programming languages, and the others about databases, platforms, and frameworks and other tools. If you think you’re not a typical Stack Overflow user, don’t self-select out of taking the survey! We’ve added question paths that are just for people who aren’t full-time professional developers, or aren’t heavy users of Stack Overflow. As in the past, we’ll be releasing the results (including the anonymized data set) to the public in March. For those of you who have already taken the survey, how do you expect the results will compare to last year’s? Which trends in technology adoption or developers’ work environments will we find? You should ask developers how much they liked working with technologies. Or at least if they did. The fact that I do not plan working with some programming language or framework doesn't mean I didn't enjoy it. And vice versa, people might end up having to plan to use technology they dislike as a necessary part of their project. And I think it is really interesting to see relationship between what people have to work with and what people love. Is there a reason this was not included, or was it simply overlooked? There was a question that asked about my involvement with Stack Overflow, including whether or not I had created a CV and/or Developer Story, but that came after this question, so I had no way of knowing that it would be covered elsewhere. And even so, I think it is fair to include your own site as an option, given how many of us taking the survey probably use it. In the spirit of providing a complement to accompany a criticism, I think it was really neat and thoughtful how you had provided follow-up questions for the "big list"-style questions, asking if there was any language/technology/etc. that had been omitted from the list. In the future, the question for "field of study" should be checkboxes rather than radio buttons. I have two undergraduate degrees, and many programmers had multiple majors. I understand that you want to gather as much information as possible (not entirely sure what for), but I think you are forgetting that the longer the survey the more people will either drop out or start just checking random boxes to get over with and earn the useless badge already. As a result, you may end up with a drop in both quantity and quality. Designing a survey is not a joke. I really hope you had some guidance rather just "Ask all the questions!" approach. Alternatively, as suggested in the comments, you could at least show some progress bar or inform us on how many question there are in total. As a side note, it would be interesting if you'd post the stats on how people answered the last question regarding the survey length. If two developers are sharing an office, is it OK for one of them to get a mechanical keyboard with loud "clicky" keys? There's only answers are for Yes or No... personally I think it's not for me to say if it is OK or not. That decision should belong to the other person sharing the office and has to listen to it all the time, not me. Personally I wouldn't care, but I'm a loud typist myself and my boyfriend frequently comments on my "keyboard pounding" ways or asking what my keyboard did to deserve my hatred, so I understand that point of view as well. 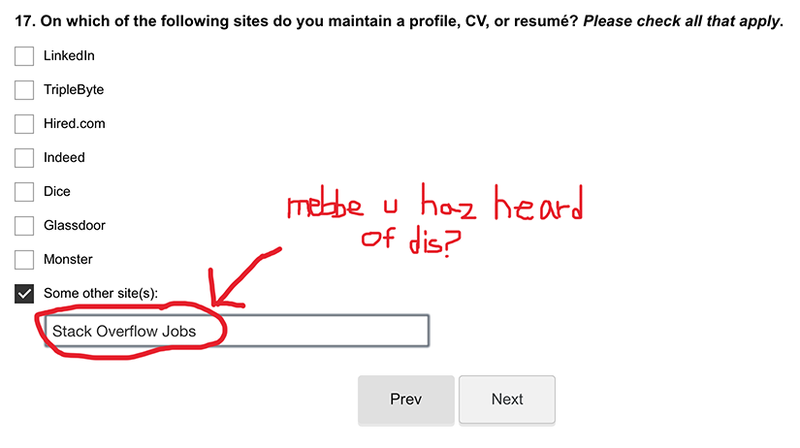 Think back to the last time you updated your resumé, CV, or an online profile on a job site. What prompted you to do so? Last of all, Question 34 needs an "Ability to adapt and learn on their own" option. That's #1 recommend for me if I were advising a technical recruiting company. I think it would be worthwhile to gather data on how much of a survey taker's company is actually software focused. I responded as a software developer for a 100-200 person company, but I'm the only software developer of any kind here. The company's size doesn't mean I'm part of a proportional team, or a team at all. The question about what field you work in can partially indicate this (ie. I put down "media") but an explicit question about how much software development focus there is would provide more accurate insight. I'd originally posted this as a comment to the original blog post, and it seems worth adding to the feedback here. Also, you might want to forward some of the feedback to the company that hosts the survey software as I too couldn't move back. For me it was when they asked for an email address, but wouldn't take a tagged (e.g. me+tag@example.com) email address. I wasn't going to give one without the tag, it wouldn't let me move forward with out providing one, and I couldn't move back to change the option that prompted for the email address in the first place. I was kind of hoping for the Linux distro question (including built from scratch). Not the answer you're looking for? Browse other questions tagged discussion survey survey-2017 . Introducing the Silver “Census” Badge! Survey ends at 57%… intentional joke or actual bug? How is our privacy protected if SO is using a third-party service for the Developer Survey 2017? When will the Developer Survey 2018 be released? Would you like to test the 2017 Developer Survey? When will the 2017 developer survey results be posted? Developer Survey 2018: Any Topic Suggestions? Is Stack Overflow considering the implications of posting the results of their Developer Surveys in the manner that they are being posted in? Developer Survey 2019: Any Topic Suggestions?